World class calligrapher with an extraordinary talent. 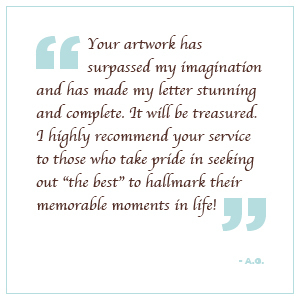 Calligraphy by Diane provides a service of beautifully handwritten work. A world class calligrapher with an extraordinary talent. In the truest sense of the word, Calligraphy by Diane provides a service of beautifully handwritten work, available in any letter style and in any language - with guaranteed workmanship! Diane's services have been commissioned by a variety of corporate clients including Chanel, Tiffany's Co. both Canada and New York, Montblanc, Cartier Toronto and New York, Holt Renfrew, Louis Vuitton both Toronto and New York, The Bay, Ontario College of Chiropractors, Environmental Printing Awards, The Miller Thomson Foundation Scholarships, Ontario Lacross Association, World Federation of Chriopractic, and Club Monaco in New York to name a few. Her work has also been featured on both television productions of Hannibal and Covert Affairs. Prestigious families such as The Weston's and The Black's Residence have commissioned Diane for their personal events. Diane also does a volume of weddings, events, poems, vows, family trees, documents and presentations, along with other unique personal projects, such as love letters, and letters of gratitude. Diane is an Honour Graduate of Fine Arts. Since the 70's, Diane has done art professionally including Television Graphics, at Huron Broadcasting, and has taught at Sault College. 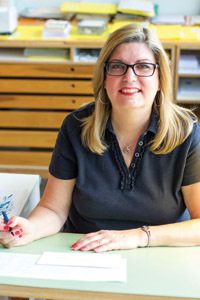 In the 80's Diane became Art Director at Monarch Broadcasting in Red Deer, Alberta, and later freelanced her art and calligraphy in Red Deer and London, Ontario.. She has taught both sign lettering with a brush (quill) and calligraphy. In the early 90's, Diane branched out into sales and marketing. This combined experience in both art and sales and marketing, came together perfectly to launch her calligraphy business in Toronto, in 1999. Welcome to Calligraphy by Diane.